A critical look at two conflicting aspects of leading left-libertarian intellectual Noam Chomsky. I need to start by saying that I love Noam Chomsky. I have often watched television images of a US drone strike perpetrated on an Afghan wedding party, or perhaps by the Israeli state on a school in the occupied West Bank or Gaza. And then onto my screen comes Noam Chomsky, speaking loud and clear, in a monotone, absolutely steadfastly, telling it like it is. As his admirers say, 'speaking truth to power'. If politicians were honest, if they told the truth, if the mass media were not so mendacious, we would not need a Noam Chomsky. But, of course, as we know, politicians lie. The media is full of professional liars. So we do need a Noam Chomsky. If he did not exist we would have to invent him. What other academic who has something to lose says it like it is with such extraordinary tenacity and courage? He has been doing so since the 1960s and is still at it today, as lucid and effective as ever. So what is my book, Decoding Chomsky – Science and revolutionary politics, all about? When people ask me, they usually want to know whose side I am on. Am I one of Noam's fans, they ask, or a critic? I can never answer this question because it all depends on whether you mean Noam the activist, or Noam the scientist. You cannot give the same answer to both. 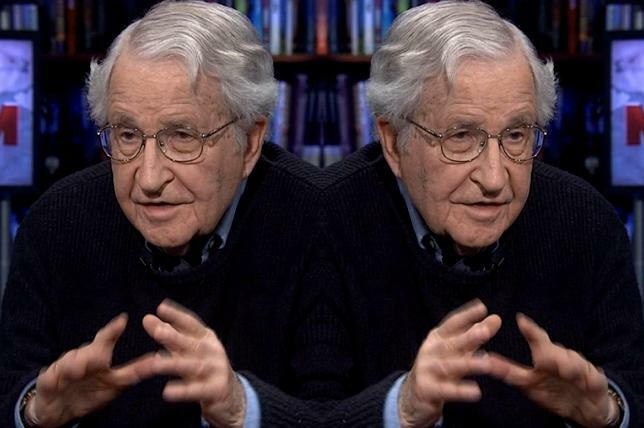 And it is not just me who says there are two Noam Chomskys. He says it himself. By way of explanation, he once suggested, with a bit of a smile, that if his brain is a computer, it is a special one with ‘buffers' between its two separate parts. He flits between the half of his brain that covers science and the other half that does activism. ‘[I live a] sort of schizophrenic existence', he elaborated on another occasion. An interviewer once asked him ‘What do [the two Chomskys] say to each other when they meet?' Chomsky replied that there was ‘no connection'. So I am not the only one who says there are two Noam Chomskys. The first Noam Chomsky is the one you most likely know about – the political activist who has spent his life denouncing the US military. But then there is this paradox: the man who made his reputation as the world's most famous critic of the US military is also the man who has spent his whole working life in one of the world's foremost research institutes specialising in weapons design. The Massachusetts Institute of Technology (MIT) has been central to the development of all the most ingenious helicopter stabilisation machines, multiple weapons guidance systems and much of what made Ronald Reagan salivate over the prospect of Star Wars during the 1980s. Many of these inventions were incubated inside the laboratories that Chomsky spent his life working in. So there we have the Chomsky paradox. One of those two Chomskys has spent his life attacking the US military; the other has been developing linguistics in the employ of a Pentagon-funded military laboratory. (Riot police confronting students outside a nuclear missile laboratory at MIT in November 1969). Let me begin by referring to a chapter near the middle of my book, entitled ‘The Cognitive Revolution'. I am always a bit surprised when I talk to Marxists, socialists, Jeremy Corbyn supporters, Occupy or Green activists about the cognitive revolution. Their eyes simply glaze over. So I tend not to start by talking about it. It is really strange that so many left activists show no interest in the cognitive revolution. It is as if they considered the biggest intellectual upheaval since Galileo's discovery of a moving Earth to be unimportant. The cognitive revolution is essentially the computer revolution. More accurately, it's the effect of the invention of computers on how we think. From the early 1960s onwards, digital computation has been revolutionising the way that philosophers, cognitive scientists, psychologists – even archaeologists – think about what it means to be human. So let me just explain a little about this. There is something about digital communication that is strange. As you know, if you have a vinyl disc and you make a pressing from it, and then make a pressing from the pressing, and so on, after a while you cannot hear the recording clearly – it degrades with each copy you make. It is the same with a photocopier – with successive copyings, eventually the pattern is lost. However, with a digital starting point you can make a million copies of copies and all of them in sequence will be perfect. That is because digital signals are either fully on or fully off and there is no intermediate position. Any digital piece of information is made up of lots of switches, each totally off or totally on, and therefore impossible to degrade. Linked to that is the fact that when communication is digital it makes not a blind bit of difference what material you are using to encode the stream of signals. Whether you are sending your message using copper, fibre-glass optical cable, pigeons or whatever makes no difference at all. As long as the signal is either off or on and the receiver can tell the difference, a faithful copy of the message will be transmitted. In other words, the information is autonomous with respect to the material in which it is encoded. Or you could say that information is now floating free of the composition of matter. When US philosophers discussed the implications of all this, they began to think that possibly it had solved the great problem that the ancient Greeks and Descartes faced long ago: how such an intangible thing as the soul can influence or be influenced by the material body. They imagined they now had the solution to the mystery: if mind can be seen as software and the body as hardware, all was now clear. It even meant that we might be able in the future to discard our hardware – our bodies – while remaining who we really are. Take cognitive science's Marvin Minsky – brilliant co-founder in 1958 of MIT's artificial intelligence laboratory and described as the ‘father of artificial intelligence'. As I discuss in my book, Minsky's main interest lay in building computer models capable of replicating the activities of human beings. Among other things, he was the scientist who advised Stanley Kubrick on the capabilities of the HAL computer in his 1968 film 2001: a Space Odyssey. If the mind really is a digital computer, concluded Minsky, then our bodies no longer really matter. Our arms, legs and brain cells are all just imperfect and perishable hardware – essentially irrelevant to the weightless and immortal software, the information that constitutes who we really are. The most important thing about each person is the data, and the programs in the data that are in the brain. And some day you will be able to take all that data, and put it on a little disk, and store it for a thousand years, and then turn it on again and you will be alive in the fourth millennium. So you can see the imaginative dreams that emanated from this conception that we humans are computers and who cares about the hardware? If your current bit of hardware falls apart, you can always install the software somewhere else. The point I am getting round to is this: all this would have only been of interest to computer nerds, technicians and engineers producing little gadgets, had it not been for Noam Chomsky. It was Chomsky who connected all this with what it means to be human. It was Chomsky who, with a great deal of authority, managed to persuade an awed scientific community that a human being can be treated as a digital computer. A characteristic of our species is that we have language, and this corresponds to the language organ in the brain. This organ is a digital computer! Chomsky managed to convince virtually the entire scientific community of this claim. But you have to wonder how he did it. The answer becomes clear when we recall who exactly were these scientists who became so excited. They were not people engaged in studying the intelligence of monkeys, apes or human beings. They were not psychologists with a special interest in how children acquire language. They were not anthropologists interested in the world's different languages or in how our species evolved. They were not even brain neurophysiologists. No, they were computer scientists. They were computer scientists in the pay of the Pentagon, tasked with the science-fiction job of making English accessible to their digital machines. Even more thrilling, they dreamed of automatic machine translation, so that not only English, but any language in the world, would be available. The stuff they were doing was clever, but would have been of zero interest to all those other scientists, had it not been for Noam Chomsky. Chomsky told them what they wanted to hear: they were suddenly made to feel relevant beyond their wildest dreams! He said that their research applied to human beings. Children, he said, are able to quickly acquire the grammar of their first language because they are in essence digital computers wired up from the outset in the necessary way. You can see why the MIT scientists loved it, needed to believe it and insisted on the brilliance of the idea. You can also see why these same computer nerds and their Pentagon backers might have wanted to confer authority on anyone who told them it was true. The claimed presence of one of their computers inside each child's head was the one thing which connected their otherwise boring technical expertise with grand issues of philosophy, psychology and meaning. If the human mind contains at its core a digital computer, then they were the experts in what it means to be human! It just had to be true. Let me now turn to one of the consequences for Marxists of this cognitive revolution. Again, it seems to me strange that so many of us are unaware of what has been done to Marxism since the end of World War II. I am talking about the complete removal of science from our horizons. Marxists never talk these days of the science behind their activism. When did you last hear a Marxist commenting on the latest research in physics, chemistry or molecular biology? When I speak of science I mean that huge collective enterprise which these days has worked out more or less what happened in the first nanoseconds after the Big Bang, which can look at the whole universe and roughly work out how galaxies were formed. Science as in modern genetics, or as in the modern study of climate change. My own – perhaps controversial – view is that there is nothing more revolutionary than hard science. It is the most revolutionary thing there is. And yet Marxists very rarely take an interest in it. Our predecessors did. For example, in the 1920s and 1930s, they revelled in the new knowledge in the fields of astronomy and genetics, and many leading scientists were themselves Marxists or at least committed leftists. I am thinking of Haldane, for example, and even Einstein. My book is an attempt to trace how this intellectual catastrophe came about. One theory is that it isn't just the Stalin version of dialectical materialism which is rubbish, but any attempt to follow Marx in thinking dialectically. Chomsky generally goes along with this. If you do not accept that theory, you need a more convincing one. My theory is social and political: the ruling class found a clever new way to utterly discredit the dragon of Marxism, not by attacking it directly, but by ‘draining the marsh' – removing the philosophical premises and intellectual environment in which Marxism had previously thrived. It was the cognitive revolution that saw to it that the connection between science and activism was ruptured. And it was Noam Chomsky who most symbolised this revolution. His fundamental thesis is that science – though of interest to specialists – is not relevant to political activism! I know that even when enthusiastic activists ask him about his linguistics he discourages them from pursuing that trail. ‘None of your business' is the disappointing message they receive. Chomsky wants us to believe that science and life pass each other by, just as they do for him. Science, he claims, deals only with highly simplified questions devoid of human interest or significance. Again, it is the way that computer science draws on the distinction between software (or information) and hardware (or the body) which makes these claims seem natural, almost self-evident. Digital information is one thing; the body – matter – is another. Information does not weigh anything; it does not occupy space; it passes by the matter it is encoded in and interacts with. For Chomsky, there is a radical disjunction between information and matter – or, if you like, between mind and body, theory and practice. Noam Chomsky says that his activism has nothing to do with his scientific work, and vice versa. His work on language is politically neutral. Learning language is something like going undergoing puberty. You don't learn to do it; you don't do it because you see other people doing it; you are just designed to do it at a certain time. So the child is equipped with all the languages that ever were, are or will be, but discards all but the one that it is actually raised in. If you are a scientific linguist you are apparently never interested in people talking to one another. You are only interested in this thing in the head of the individual who is said to be talking to himself or herself. To count as the study of nature, linguistics must exclude the investigation of human social interactions, politics, communication or culture. Yes, the bizarre logic goes that far. These are the basics of Chomsky's linguistics, of the philosophical underpinnings of his whole life's work. I am not giving all these quotes to show that they are nonsense, by the way: I am doing it to suggest that we need to ask why this whole set of ideas dominated vast swathes of Western thought from the early 1960s onwards. As I state in my book, I am approaching this as a social anthropologist would. In other words, if, say, you listen to a shaman or tribal elder – a person of importance who may be saying deep and meaningful things, even if they are nonsense to you – you have to investigate the causes of his authority, which gives this nonsense meaning and significance for the tribe. It is the same with Chomsky. I am generally happy with my 1991 book, Blood Relations, but it had a huge hole in it: it did not get to language, a key element. Why did I leave it out? Well, because when I researched language I started reading Noam Chomsky, the world's expert, but I could not make head nor tail of it – it was completely baffling. Naturally I thought it was my fault that I did not understand it – after all, I am not a mathematician, so I would not expect to fully understand Einstein either. After all, everyone says Chomsky is a genius, so I thought I would have to work really hard to get my head round it. It took me 20 years to fully understand it, but what I immediately worked out was that, although I loved Chomsky's politics, his linguistics were so baffling that what I had to do was study the social tribe in which it was incubated. What was the time, the place, the institution, the political circumstances in which all this nonsense took root? The ‘tribe' I needed to investigate was the US war science community immediately after WWII. In other words, it was the inhabitants of a large number of Pentagon think-tanks who, just after defeating the Nazis, were beginning to turn all their attention to ‘Communism'. They were drunk with power at that time. Europe was in ruins, China was nowhere, they had just invented the nuclear bomb and dropped a couple; and now they were dreaming of using their computers as omnipotent command-and-control instruments for eavesdropping on the world's communications and, above all, for guiding their nuclear weapons to hit their exact targets. That was what I needed to investigate and the resulting book is about this particular tribe. What I am trying to argue is that, as soon as you do look at that period, you realise why the military needed someone like Noam Chomsky to solve a number of their problems. I should stress that nothing that Noam produced was even slightly useful militarily to the Pentagon. None of the language modules he developed ever worked and I do not think he wanted them to work: his anti-militarist conscience was too strong. To be able to look himself in the mirror each morning he needed to do the work for which he was paid, but refuse to step over the line from abstract theory into any military application. My whole thesis is that there were good social and political reasons why it became acceptable to isolate theory from practice in this way. As Perry Anderson showed long ago, all the various schools of Western Marxism became mentalist in the way that I have discussed: mind over matter, software more important than hardware, turning Karl Marx upside-down. Marx, of course, had the view that if you want to understand what goes on in the mind you need first to understand what happens in and through the body – eating, reproduction, cooperation, the relationship between the means of production and the relations of production – in order to work out what is in the head. The cognitive revolution proved so dangerous to the Marxist movement because it successfully turned this idea on its head. Almost all supporters of the cognitive revolution acknowledge Noam Chomsky as their mentor, their founder. Many describe what he did as the triumph of mind over matter. In fact they go further: they say that with the cognitive revolution we scientists abolished matter. If you are serious, you no longer study matter – you study the mind. So how did all this come about? To figure it out, I want you to put yourself in Noam Chomsky's place. While you are not necessarily a pacifist, you have been strongly opposed to killing people since you were a teenager. When Chomsky heard about Hiroshima on a summer camp somewhere, he went very quiet. Everyone around him was very happy that the US had managed to ‘get the Japs', but Chomsky found that he could not talk to anyone – the shock was just too much and he needed to be alone, as though he was in mourning. In other words, he always felt a massive, deep and instinctive hostility to nuclear weapons. So imagine Noam Chomsky when he found himself not only with a well-paid job, but heaped with honours for what he was achieving in what he termed a ‘Department of Death' – a laboratory on a campus heavily involved in the production of nuclear missile guidance systems and other weapons. The question is, how did he manage to cope? I have documented in chapter 4 of my book how, when his own students were just beginning to rise up and demand the closing down of MIT's military laboratories, Chomsky wrote a letter, which was published in the New York Review of Books, saying that he was thinking of ‘resigning', because MIT was up to its neck in actual or potential war crimes. Chomsky had not meant the letter to be published, but when it was, suddenly everyone must have assumed that he was resigning in disgust because of what his own institution was up to. After some time, Chomsky decided not to resign after all. He explained this decision by writing that his previous letter had been quite ‘unfair'. MIT was not an institution devoted to making weapons of mass destruction. Yes, he conceded, there might well be ‘individuals at MIT' working on such weapons, but his university as such was an honourable, ‘libertarian' institution, allowing him complete freedom to follow his own conscience without any pressure. We were actually friends and got along fine, although we disagreed on about as many things as two human beings can disagree about. I liked him. We got along very well together. He's very honest, very direct. You know where you stand with him. Chomsky voted for him in the election for principal of his college. Most of Chomsky's friends said, ‘You can't vote for that man' – it was Deutch who invented the fuel-air explosives. When dropped from planes, they explode above the ground, destroying everything below and killing everybody, but hopefully leaving much of the equipment intact. Noam Chomsky was friends with this guy. There he was, in the evening denouncing the CIA to his anarchist friends. Then he gets up in the morning, goes to work and then sits down and perhaps has a coffee with his friend, John Deutch, the future director of the CIA. So what could Chomsky do? One obvious solution was to keep his two constituencies at arm's length from each other. He might keep the military people and their boffins over in one corner of his life, and his anarchist friends somewhere else. He might try to create a firewall between the laboratory work and his activism, so that the two camps do not speak to each other and cannot in any case understand what the other lot are saying. He would have to speak one esoteric, highly specialised language to one side and a completely different language to the other, with a firewall in between. Because Chomsky was so highly respected, no-one could fault his moral integrity as an anti-war activist, and no-one could fault his standing as a scientist either. I am not blaming Chomsky for adopting the position he took. We all have to make compromises of some kind, given the conditions we live under. I am thinking particularly of people with jobs in the mendacious media, academics, people in the arms industry, bankers – we all have to earn a living and our work is not always what we would like it to be. But we have to be able to hold our heads high and think of ourselves as doing a good job. Where this happens, there is a divide between what we are obliged to do as paid workers or professionals and what we might do as autonomous activists outside our jobs. It is not an easy matter to get the two to connect. But, while many of us face that contradiction, Noam faced in it more of an intense form than anyone else I can think of. The world's number-one critic of the US military was working as a prominent scientist in a militarily funded laboratory. How do you square that? If you are Noam Chomsky in this position, you need to find a way to make your linguistics as politically irrelevant as possible. So you define language in a new way. You define it as not even social. You have to remove every last trace of social science, of anthropology, psychology and so on. You make it like mathematics. So Chomsky's strange conception of language is what happens if you must remove every last trace of politics from your linguistics. We know quite a lot now about how words emerge. We know that there is some link between the sound of the word, its shape, and what it means. As language develops and we develop shorthand, that link eventually disappears. Certainly words are coined by people who may come up with a metaphor which seems to be quite clever and appropriate. Then someone else thinks of a different metaphor, and the first one becomes a tired, dead metaphor, then a purely grammatical marker. But the point is that words are historical, cultural products emerging out of social interaction. But for Chomsky there is a problem with all this. He needs to be able to claim that words too are ‘natural' and installed in the brain from birth. So what about the word, ‘book'? In the Stone Age, when the concept of a book was unknown, did people have the word in their heads? Chomsky says they did. How about ‘bureaucrat'? They didn't have those in the Stone Age either. Chomsky said, yes, the word was always there in people's heads. What about ‘carburettor'? Yes, that one too. What I find is that, whereas Chomsky's anarchist supporters know that he defines universal grammar as innate, they are astonished to be told that this applies to lexical concepts (words) as well. So I read them out all this stuff, expecting them to start laughing – Stone Age people with the lexical concept of a book, a bureaucrat, or a carburettor in their heads? Why would a world-renowned linguist need to say such strange things? The point about language is that it is where nature meets society, politics and culture. If you want to know where language comes from you need to look at the big picture. You have to link up the Earth sciences – geology, the science of climate change during past periods, anthropology, the study of apes and monkeys and fossils of human ancestors. You have to join the humanities with the sciences to understand how we came to possess language. But Noam Chomsky was forced by his job to separate the two domains. He did this by placing language in the natural sciences, totally at the expense of anything social or political. So towards the end of my book I go into some detail on the question of how all these different sciences link up, converging on an adequate theory of the origin of language. Over the 20 years since I published Blood Relations I have helped establish and sustain Evolang, the main international research community and conference series dedicated to the origin of language. To explain the origin of language you cannot just invent a theory. You need the international scientific community to study this hugely challenging and difficult problem. And over the years I think we have got somewhere. We know roughly how language evolved in our species. We have our disagreements, but I basically think we are on the verge of cracking it. How does Noam Chomsky deal with what we say? First of all he did not – he just refused. But then, after he came to some of these conferences, his friends were saying to him that he could not continue to assert that language was simply there in the brain: he had to have a theory about how it gets there. He came up with the idea of a 'great leap forward' – a sudden revolutionary transformation. But if we became human through a revolution, wouldn't that idea be politically subversive? Unable to propose anything which might seem remotely political (because for him science must never be political) Chomsky ended up with the most non-political, neutral, irrelevant version of a revolution you could possibly imagine. Finding a solution was no easy matter. How can you make the greatest revolution in all history – the one which constructed our humanity – appear unconnected with revolutionary politics? How can you make it all seem completely irrelevant? Well, here was an answer. How about you have an ape-person wandering around who gets bombarded by a ‘cosmic ray shower'? These cosmic rays then cause a mutation which installs a language organ in the brain. Not just any old language organ, but a perfect one, fully formed in an instant, whereupon this ape-person begins talking to itself. That is Chomsky's suggestion. Chomsky says that although language is perfect in design, it is superficially imperfect. What he means by this is that humans do not use language like robots. We do not speak in digital code, but expect that a listener will use a little imagination and employ proper interpretation to understand the intended meaning, whether we are using metaphors or other figures of speech, or perhaps humour. We need a certain level of trust on the part of our audience. That is the reality: language relies upon a certain amount of goodwill, cooperation and trust. But for Chomsky the ambiguity of language is one of its defects. It prevents it from being perfect. For him the fact that people speak different languages is another imperfection. As are the differing phonetic structures. If things were perfect, we would all be speaking t he same language and all these ambiguities about meaning would not exist, because basically we would be talking to ourselves. In conclusion, I have tried to explain why Chomsky's science is everything which his political output is not. His science is individualistic to the nth degree; meanwhile, his politics celebrates solidarity and is basically socialist. Chomsky has validated the idea that since these two modes of thought are so utterly different, activism is best conducted without reference to science. Conversely, he argues, scientists need to do their work completely autonomously, without worrying about any political implications. In opposition to Chomsky, I believe that nothing is more revolutionary than science and that to be revolutionaries we all have to be scientists. Science is intrinsically internationalist. Climate science in particular has urgent political consequences. Borders and states are getting in the way of putting things right – we have one planet, a living planet and we need to look after it. Chris Knight is author of Decoding Chomsky: science and revolutionary politics, Yale University Press 2016. 1. N.Chomsky, Class Warfare (1996), p15. 2. CP.Otero, Noam Chomsky: Language and politics (1988), p98-9, 318. 4. K.Hayles, How We Became Posthuman (1999), p244-5. 5. Otero, p318; N.Chomsky, Radical Anthropology No.2, (2008), p23. 6. Otero, p592; N.Chomsky, New Horizons in the Study of Language and Mind (2000), p115. 7. N.Chomsky, Language and Problems of Knowledge (1988), p174. 8. N.Chomsky, ‘Lecture at the University of Rochester', 21/4/16 - available on Youtube (1hr17mins20secs). 9. P.Anderson, Considerations on Western Marxism (1976). 10. In 1969 the radical student newspaper, The Old Mole, described MIT in this way: ‘MIT isn't a center for scientific and social research to serve humanity. It's a part of the US war machine. Into MIT flow over $100 million a year in Pentagon research and development funds, making it the tenth largest Defense Department R&D contractor in the country. MIT's purpose is to provide research, consulting services and trained personnel for the US government and the major corporations – research, services, and personnel which enable them to maintain their control over the people of the world.' I.Wallerstein, University Crisis Reader Vol.2 (1971), p240-3. 11. New York Review of Books, March 23 1967 and April 20 1967; A.Davidson, Foucault and his Interlocutors (1997), p144. 12. N.Chomsky, Class Warfare (1996), p101. 13. N.Chomsky, New Horizons in the Study of Language and Mind (2000), p64–66. 14. D.Dor, The Social Origins of Language (2014). 15. N.Chomsky, The Architecture of Language (2000), p4; N.Chomsky, The Science of Language (2012) p 44, 51,78; N.Chomsky, Powers and Prospects (1996), p29-30. 16. N.Chomsky, ‘On the evolution of language', UNAM Skype talk, 4/3/16, (40m); N.Chomsky, The Science of Language (2012), p44. 17. N.Chomsky, On Nature and Language (2002), p76, 148. It is pretty clear that a child approaches the problem of language acquisition by having all possible languages in its head, but doesn't know which language it's being exposed to.